My sewing machines have been sorely neglected, too. We’ve had two floods in our finished basement in the last 6 months or so, which has really been a joy. And since that’s where I sew, that’s really put a damper on my creative outlet. But! The sewing room is finally (mostly) put back together. And I’ve finally gotten a little bit of sewing done! As always, Adrianna with Hey June Handmade gave me some motivation to finally get back to sewing – just when I needed it most. Adrianna’s newest pattern is the Sandbridge Skirt, which just released last week! This is classic, relaxed jean skirt with raw edges. I’d never thought of having frayed edges on a jean skirt, but I love the relaxed look it provides. I used a soft blue denim from my stash*, which I believe I purchased from Pacific Fabrics at least a year ago. I haven’t worn skirts/dresses much since I had the kids, but this pattern has me rethinking that. I made a size 12, and then took in the waist by about an inch. I’ll take in the waist a little more on the next version so it’s a little more snug at the top. I wasn’t confident enough (and perhaps was a little too lazy) to use actual top stitching thread, so I just used standard weight thread in yellow. While this gives it a bit of the standard jeans look, I think I’ll be braver on my next pair and actually go with the top stitching thread. I can definitely see how the thicker thread would really add something to the skirt. Maybe I’ll play around with the design on the pockets, too. Some of the other testers did some really great pocket designs! Overall, I highly recommend this pattern. I’ve made a couple of other pairs of jeans (here and here), plus another jean skirt (unblogged), but I liked the instructions for the waistband in this pattern the best out of all of them. Lately, I’ve only really been sewing when asked to be a tester for a designer. While it’s awesome to be asked to test, I’ve realized that this means that I haven’t really been thinking about what holes there are in my wardrobe (and there are a lot!). Since having kids, my wardrobe has shrunk drastically, merely for the fact that most of my pre-pregnancy clothes no longer fit. Pregnancy really alters a body! While I’m back to my pre-pregnancy weight, I think I’ve just got to accept the fact that my hips will never be their pre-pregnancy size again. This means that most of my pre-pregnancy pants no longer fit. So, it’s time I start thinking about this new body I have (and accept that I have a lot of clothes to donate…). Since summer is approaching quickly in Seattle, it’s a good time to think about designing my summer wardrobe. It’s also a good time to go through all of my patterns and pick out those that have been sitting there, just waiting to be tried! First, I want to make some shorts and pants. I purchased the Coachella Shorts pattern ages ago, but it remains unprinted and unmade. I’ve seen tons of versions of these pop up, and I’ve loved them all. These look like really fun shorts to wear this summer and I am excited about making a pair (or two). Another pattern I’ve been meaning to try for a long time is the Ginger Jeans. I’ve made jeans before (with the Jalie jeans pattern and the Style Arc Sandra jeans pattern), but these look a little different and I’m curious about different fly techniques. And my wardrobe definitely needs more jeans! I am in desperate need of some new tops for work and the Biscayne Blouse seems like the perfect top to wear under a cardigan and over some slacks or a skirt. I’ve got lots of fabric just waiting to be made into Biscaynes. Finally, in terms of tops, I need some good cardigans. Cardigans are a wardrobe staple of mine, worn pretty much every single day, so I can’t believe I have yet to make one. I’ve seen some cute versions of the Jenna Cardigan pop up, so I’m hopeful that this will become my go-to cardigan pattern. I’ve got some other plans for some workout gear and some dresses, but I think this is a good start. Just listing these patterns out has gotten me excited about getting back into my sewing room (which is currently completely torn up because of a busted water heater which leaked all over the basement…) and getting started on whipping up some new clothes! 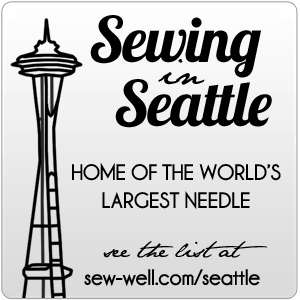 We’ve had a span of some really great weather in Seattle lately, so I’ve started thinking about doing some sewing for my summer wardrobe (after having babies, none of my clothes fit! I’m kind of back to square one with my wardrobe!). So, it was fortuitous when Adrianna of Hey June Patterns asked if I would test her Santa Fe top pattern, which is the perfect casual summer wardrobe staple. It’s a loose drapey top, which looks best with very light knit fabrics. I made two versions. This one is view e, with contrasting panels inset on the sides. I used some knit fabrics I had in my stash (the stripes were a Girl Charlee KnitFix fabric and the purple is a mystery knit that has been in my stash so long I have no idea where it came from…). I skipped the hemming so as to leave it as light and flowy at the bottom as possible. I also made view a, skipping the center seams so as not to interfere with the floral pattern on the fabric. This was also fabric from my stash, made with a Girl Charlee KnitFix fabric from ages ago. I hemmed this one because it wasn’t as drapey and I didn’t think the hem would interfere with the flow (and it really didn’t – as this fabric wasn’t super flowy to begin with). While the straps are narrower on view a, Adrianna did a great job of making sure that they were still wide enough to cover bra straps. After having tried two different types of fabrics with this pattern, I have to say that I think the lighter, drapier fabric has a better overall fit and looks nicer. But both tops will definitely get worn a lot this summer. I was flattered when Adrianna from Hey June Handmade asked me if I would test her upcoming Charleston Dress. A knit dress with two skirts and seven (7!!!) sleeve options?! How could I refuse? I went in with pretty high expectations, thinking that the dress sounded pretty awesome. And it did not disappoint! I made view a, sleeveless, in a size large. I used a 1.5 inch hem, just because I’m short and I wanted a shorter skirt. The fabric I used was a ponte from Pacific Fabrics. I need opinions on this fabric – I bought it thinking it was an animal print, but my husband thinks it’s camo. Thoughts? The directions, as per the usual with Adrianna’s patterns, made this an extremely easy to put together dress. And quick! I made this in one evening, taking my time and going very slowly to ensure that everything fit perfectly as I went. Even the zipper was easy and quick! And, while I don’t actually need the zipper, I love the design element – it makes for a more interesting back, which is fun. Some of the other testers put in a colorful zipper and I love the way it pops! I will admit, I was pretty nervous putting a zipper in a knit dress. I tried to put a zipper in a knit cardigan once, years ago, when I had less experience sewing with knits, and it was disastrous. I hadn’t tried since, fearing that my fabric would get all stretched out and look terrible. But it didn’t! It helped that, this time, I used a more stable knit and a walking foot (love my built-in IDT on my Pfaff! ), but there was no wonkiness at all. The fit was great without any modifications, and I feel like it covers up my post-twins-baby-belly really well. Overall, I’m really pleased with this dress. I have my next version planned – a view b in a stretch lace that I’ve had for a couple of years, just waiting for the right project. I think this is it! I have been sewing, despite my lack of posting. Eventually (maybe) I’ll get caught up… but, to be honest, I have found that hanging out with these guys is a bit more fun that hanging out on the computer in the evening… so maybe not. Regardless, I do have a new make to show today. I made this back in November, and I’m really happy with how it turned out. It’s the Cheyenne Tunic by Hey June. (Full disclosure, I tested this pattern before it was released – the only change made from this version to the final was to widen the hips 2 inches as the top was a bit too tight on most of the testers). I made View A in the tunic length. I widened the hips a little on my version by making the seam allowances smaller, but that has already been changed with the pattern itself, as mentioned above. The other changes I made were very small – I used floral accent fabric on the button band, collarstand facing, and sleeve tabs, and I used pearl snaps instead of buttons (so much easier and quicker!). The fabric used was a chambray for the main fabric and a floral cotton shirting from Pacific Fabrics. I love the look of the fabric, but the chambray wrinkles like crazy! This shirt would be worn a lot except for that. I’m going to make another version of this top with a less wrinkly fabric. I also have a vision of this as a shirtdress and can’t wait to have that item hanging in my closet! If you’re worried about making a button up top, Adrianna recently did a sewalong on the Hey June blog to walk you through all of the steps on how to make this top. So check it out here.